TSR Copy Changed Files Software - Free software for logging changed and modified files. The copy changed files tool is a free program that lets you copy changed files from one directory tree to another. The program only copies changed files, leaving all other files behind. You can either select to use the date and time for change check, or you can use the binary compare option. 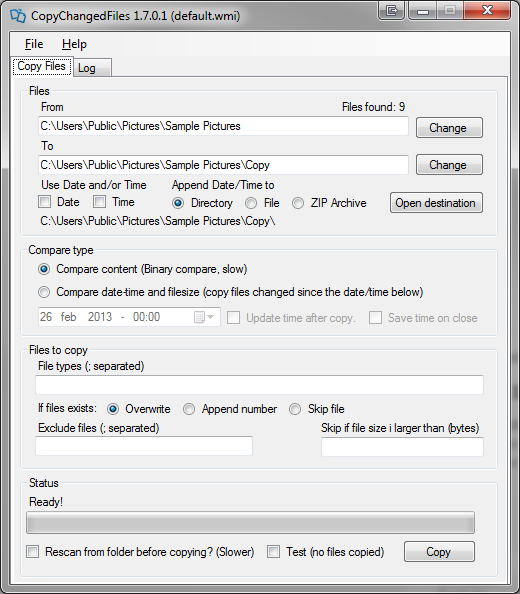 When you have selected how to check for changed files, you can select if you want to append date and/or time to the destination directory/file. Binary comparison of files using a database of file hashes. Save last run time, for incremental backup of changed files only. Append current date to destination directory or file for easy version maintenance. Set the from date, to scan for files changed after that date. Maintain directory structure in destination directory. Exlcude files from copying, ex. thumbs.db. Automatically check for new version.